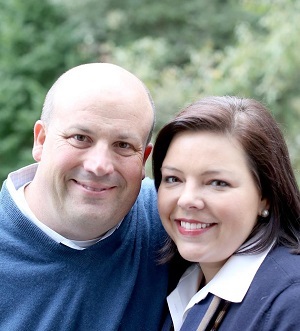 Congratulations to Tom Jenkins and Katie McCord Jenkins, our 2018 Philanthropists of the Year! 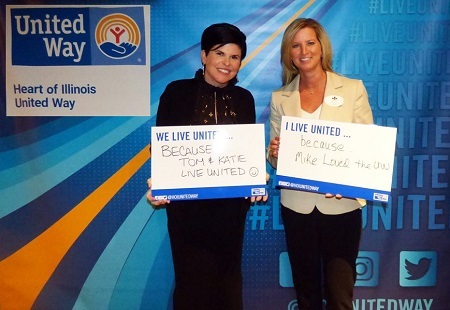 In honor of the McCord Family’s long-standing support of central Illinois, this annual United Way award is now named the McCord Philanthropists of the Year to recognize the legacy of Michel and Kay McCord. At the heart of their work, rooted in love, was a constant commitment to the community. Those honored with this award emulate the McCord’s values. 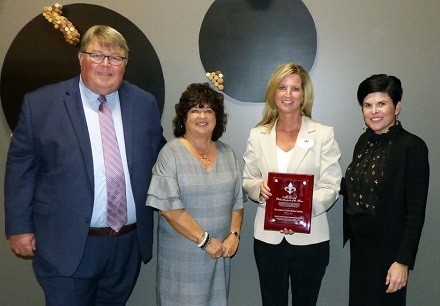 Amy Epkins with Illinois Mutual Life Insurance Company, accepted the award at our October 5, 2018 Tocqueville Society Reception. The Tocqueville Society is named in honor of 19th century French historian, Alexis de Tocqueville who made the important observation that Americans helped each other in times of need. He recognized, applauded and immortalized the voluntary spirit that lives in America’s heart and remains the foundation of the United Way. Tocqueville Society Chairs Mark & Reneé Spenny with Amy Epkins, Illinois Mutual and Jennifer Zammuto, Heart of Illinois United Way.